Five of London’s finest join forces to breathe life into eight of Brennan’s songs, and also to jam with him in uncomposed settings. The result is an ensemble record whose only dominant voice is Julie Tippets, and then only during the straighter sections. Elsewhere, the group fuses together, overcoming its individuals’ strong musical personalities to create a cohesive sound. Brennan’s setting reflect the concerns of the poems he chooses. So, Meehan’s “No Go Area” is a military march, Poe is given a folk melody, Heany gets two disconsolate pastorales. A rather misogynistic Shakespeare sonnet is accompanied by an ironic striptease wail (who’d have thought that was in Parker’s trick bag? ), creating a careful balance between the polyphony of New Orleans and the polyphony of free improv. Parker has often spoken of himself as a chameleon, adapting his playing to fit the demands of different situations. Many listeners know him only for his uncompromising improvisation, forgetting his work with Schlippenbach, Wheeler and, now, Brennan too. Of course, he still sounds like Evan Parker, but those who think that Conic Sections or the trio with Lytton and Guy are the beginning and the end of his work are in for a surprise. This holds true for Rutherford, too, long a co-conspirator in some of Parker’s most challenging music. Perhaps it’s a perverse decision to get together a group of first-rate improvisors to perform your compositions, but Brennan is nothing if not perverse. And, as elsewhere, the perversity pays off. 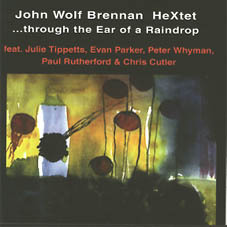 These are all musicians who are perfectly capable of carrying the tunes, but Brennan seems to have wanted more than that, players who will inject imagination into these actually quite simple arrangements, players who can hardly resist the temptation to interpret freely and light the music up like a pinball table.